A team of researchers from California’s GI Innovation Group have developed a wearable stomach monitor that can monitor electrical activity in the stomach and collect clinical data in an identical way to an ECG for the heart. The scientists believe the device could help people with gastrointestinal problems determine with greater accuracy whether applied treatments or diets are working. If the device receives clinical validation, it could help revive an obsolete medical technology called electrogastrography (EGG) that once aroused gastroenterologists’ interest, but has largely been abandoned due to controversy surrounding its relevance in diagnosis. “This might prove to be a clinically useful tool that people accept,” says Thomas Abell, a gastroenterologist who was not involved in the new study. According to the American College of Gastroenterology, diseases of the gastrointestinal tract (GI) are particularly difficult to diagnose. Symptoms of a GI tract disorder are heartburn, indigestion, bloating, and constipation. One or more of these symptoms could be due to diseases like Gastroesophageal Reflux Disease (GERD), Irritable bowel syndrome (IBS) or peptic ulcer, acid reflux, etc. But generally symptoms cannot be contributed to a particular disorder, and often times healthcare professionals produce wrong diagnosis even after conducting various tests. Researchers at the University of California San Diego (UCSD) have been working to develop a wearable device that will enable doctors to track GI activity even when the patient isn’t physically present at the clinic. How does the stomach monitor work? The new wearable is made up of a 3D printed box that holds the battery and electronics. These electronics and battery are connected to 10 electrodes, which are the same type used in ECG monitors, and are bought from stores. To get an error free report, the developers of the GI monitoring device use a multi-channel system and different signal processing techniques. The wearable device will eliminate the need for diagnostic and invasive procedures that cost money without producing an accurate prognosis. The researchers have tested the tracker on 11 children aged between 7 and 17, and an adult. The participants underwent a procedure called antroduodenal manometry, where a catheter is placed in their nose to study pressure in the forestomach. The wearable works by tracking the gastric slow wave – a wave produced in the stomach that navigates down to the small intestine. 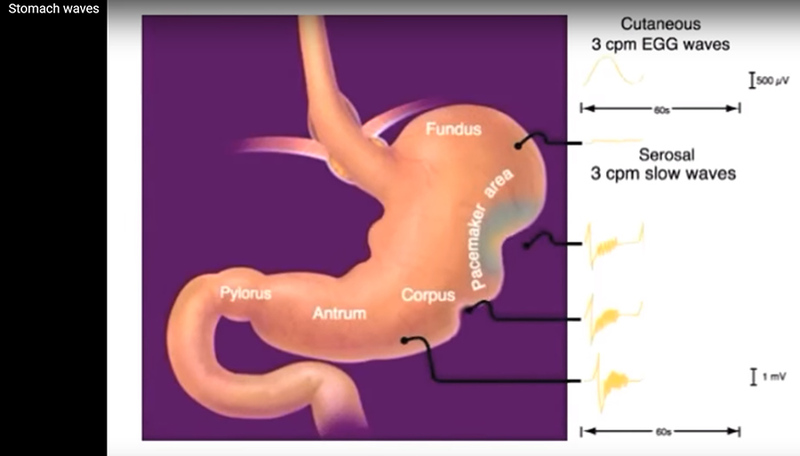 This gastric slow wave performs contractions in the muscles that break down food during digestion and carry it along the GI tract. Studies have shown that irregularities in this wave are associated with gastroparesis, functional dyspepsia, and chronic nausea and vomiting. As of now, the device is still being studied and needs more enhancements. The researchers plan to market it for monitoring a variety of GI-related disorders. They are eyeing small business grants with this view.